The Keysight 8753ES is available to buy refurbished used or rent, usually from our UK stock. Click here to download the Keysight 8753ES datasheet. The Agilent 8753ES is a member of the 8753xx range of RF network analyzers that offer an unbeatable combination of speed, performance and ease of use to meet your measurement needs, whether in the R&D laboratory or on the production floor. With an integrated test set covering to 3 or 6GHz, up to 110 dB of dynamic range and both frequency and power sweeps, the 8753ET and 8753ES give you a powerful solution for characterizing the linear and nonlinear behavior of active and passive networks, devices, components, and subsystems. Family Features: Selecting the transmission/reflection analyzers (ET model) or S-parameter analyzers (ES model) allows you to choose the optimum level of performance versus cost for your application. The network analyzers feature two independent measurement channels that can measure and display up to four parameters simultaneously. You can choose to display any combination of reflection and transmission parameters, with magnitude, phase, group-delay, Smith-chart, polar, SWR, or time-domain formats. Easy-to-use softkeys let you access measurement functions quickly and you can view results in overlay or split-screen format on the crisp, LCD color display using up to four graticules. A VGA -compatible output has been added to drive larger external monitors for enhanced viewing. Test sequencing allows rapid, repeated execution of complex measurements with a single keystroke. In test-sequence mode, you make a measurement once from the front panel and the analyzer stores the keystrokes so that the measurement can be repeated without any additional programming. You can also use a test sequence to control external devices through the parallel or GPIB port. For measurements of mixers, tuners, and other frequency translating devices, the frequency-offset mode allows the network analyzer source to be tuned independently from the receiver. Measurements of conversion loss, phase, group-delay, and mixer tracking can easily be done, with either fixed or swept-IF testing. Power-meter calibration provides leveled absolute power to devices that are sensitive to absolute input or output levels. The 8753ET/ES automatically controls an 436 A , 437B, 438A , E4 418B or E4 419B power meter to set the power anywhere in the test setup with power-meter accuracy or to calibrate the network analyzer receivers for accurate absolute-power measurements. Other productivity features include a built-in floppy-disk drive supporting LIF, DOS, JPEG, and comma separated variable ( CSV ) formats, non-volatile memory, serial and parallel interfaces, a DIN keyboard interface and a real-time clock for time-stamping of printouts and files. Limit testing, arbitrary frequency testing and marker-tracking functions are included. You can reduce measurement time by using swept-list mode to choose specific frequencies to test and to set independent IF bandwidths and power levels in each frequency range. Segmented calibration and interpolated error correction allow you to apply vector-accuracy enhancement over a subset of the analyzers calibrated frequency range. The 8753ET/ES code compatibility with the 8753D/E enables you to leverage your existing software. W ith Option 010, you can view reflection or transmission responses in the time domain. The analyzer computes the inverse FFT of the frequency-domain data to display the reflection or transmission coefficient versus time. Two time-domain analysis modes enable you to view the step or impulse response of your device. Time gating can be used to remove unwanted responses such as connector mismatch and the gated results can be displayed in either the time or frequency domains. Combine an S-parameter network analyzer with the time domain capability to provide a simple, deterministic method for tuning cavity-resonator bandpass filters. Comparing the filters reflection response in time-domain with the response of a properly tuned filter reveals which resonators or coupling adjustments need to be tuned. With time-domain filter tuning, you can easily train new personnel for this complex task and greatly simplify fine-tuning and troubleshooting procedures. For more advanced characterization of devices, Option 002 adds harmonic-measurement capability. Swept second and thirdharmonic levels of an amplifier can be displayed absolutely or in dBc relative to the fundamental. With the press of a button, you can measure harmonics down to -40dBc. A high-stability frequency reference, Option lD5, improves the frequency accuracy of measurements of high-Q devices such as SAW and crystal resonators or dielectric-resonance filters. ET Models: The 8753ET features a built-in 50 -ohm transmission/ reflection (T/R) test set providing a full range of magnitude and phase measurements. Frequency coverage is from 300 kHz to 3 or 6 GHz. The T/R capability provides a very high level of accuracy and convenience in making forward measurements of the device under test. Enhanced response calibration corrects for the effects of source match in a transmission measurement. Option 004 extends the standard -20 to + 5 dBm source power range to -85 to + 10 dBm. 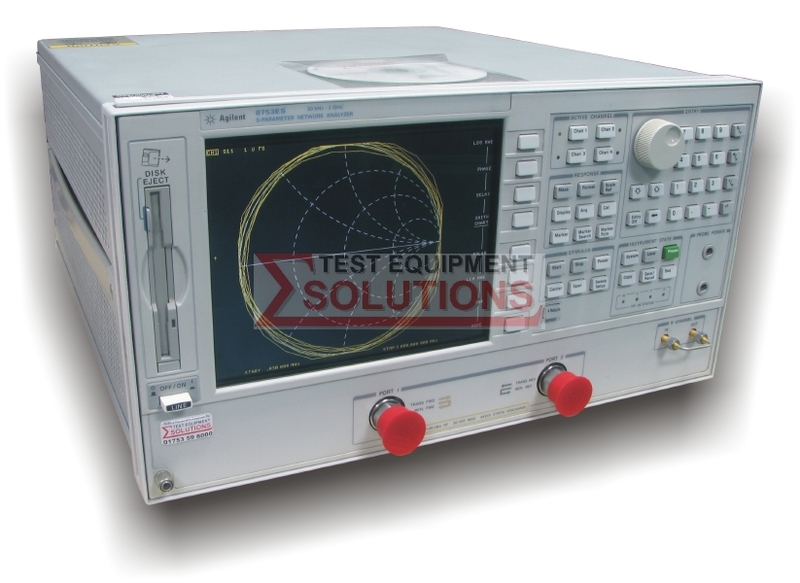 We offer the refurbished used Keysight (Agilent) 8753ES 3GHz Vector Network Analyser for sale and rental. The Keysight 8753ES is fully tested and refurbished in our in-house ISO9001 calibration laboratory. We supply manuals, accessories, full warranty and a free-of-charge Certificate of Conformity. We can also provide the Keysight 8753ES with a fresh calibration for a small additional charge. If you have under-utilised test equipment talk to us about trading-in or part-exchanging it towards the Keysight 8753ES or other refurbished test equipment.